Can't Remember Faces? Blame Your Genes People who struggle to remember faces can blame their parents. The ability to remember a face is inherited, according to a paper in the Proceedings of the National Academy of Sciences. People who struggle to remember faces can blame their parents. That's because the ability to remember a face is inherited, according to a paper in the Proceedings of the National Academy of Sciences. Researchers also found that people who are good at remembering faces are not necessarily good at other memory tasks. Taken together, these results strongly support the idea that face recognition ability comes from a dedicated circuit, or set of circuits, in the brain. The paper, which comes from an international team, included two different studies. The first looked at nearly 300 pairs of twins. Some were identical, meaning they share all their genes; others were nonidentical twins, who share only half their genes. 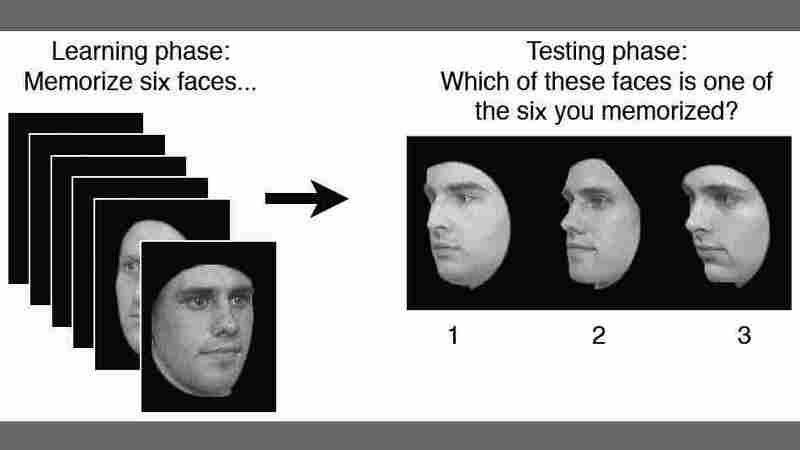 All the twins took a test that involved memorizing six faces. Then, participants were shown three more faces and were asked to identify the one face in this group they had seen before. The face recognition ability of pairs of nonidentical twins often differed quite a bit, says Jeremy Wilmer, the study's lead author and a psychologist at Wellesley College in Massachusetts. But that wasn't the case with pairs of identical twins, whose performance was "extraordinarily similar," Wilmer says. These results offer strong evidence that "face recognition ability is a highly familial trait," Wilmer says. The second study used a Web site to test the ability of several thousand people to remember faces, word pairs and abstract art images. The study found no link between face recognition ability and scores on the other tasks. All of this supports the idea that there is a part of the brain that specializes in processing faces, says Nancy Kanwisher, a brain scientist at MIT. The most likely candidate is the "fusiform face area," which is located "just behind and underneath, and a bit from your right ear," Kanwisher says. She says it makes sense that our genes would include special code for such an area, because faces are so important to humans and some other primates. Faces tell us whether we know a person, what mood they're in, how old they are, and whether they are looking at us or something else, Kanwisher says. "All this rich visual information you can get from a brief glimpse of a face." Face recognition appears to be so basic, she says, that it is actually hard-wired into the brain. Japanese researchers provided strong evidence of this in an experiment with monkeys a couple of years ago, Kanwisher says. The researchers spent years raising monkeys who never saw a face — human or monkey. The animals were separated from other monkeys, and their human caretakers wore masks. Even so, when the monkeys were tested, they had "adult-like face discrimination abilities," Kanwisher says, adding that this is probably because the ability to recognize faces is carried in our genes and present from birth. The finding in monkeys is consistent with experiments on human babies just a few days old, Wilmer says. When a baby is presented with representations of things like a circle or square and a face, Wilmer says, "The baby will spend a lot of time looking at the face relative to the other things."